​Axe throwing is done just like what you learn on how to throw a tomahawk. It is an activity in which a person throws an axe at a target, attempting to hit the bulls eye as near as possible. Having the perfect grip and stance are important factors in hitting the target. In gripping the axe, hold it firmly in your hand with a fist grip. Step back into a wide stance with the foot that corresponds to your throwing arm pointing forward. Keep your wrist rigid as your throw your axe, releasing the shaft as your arm arcs down toward the target. Make sure you are not trying to guide the axe with your wrist or fingers; the force, momentum and direction are all determined by the rigid forearm and wrist. 1. Hold the axe at your side by the end of the handle, with the blade facing back behind you. 2. Firmly stand with the proper stance. Remember to put most of your weight on the side of your right food, opposite if your left handed. 3. Raise the ax up with over your head with the blade facing ahead of you. Bring it up until it you have made a focus on your target. 4. Bring the blade over your shoulder and then release the ax when your arm is out in front of your body just slightly above your shoulder. It's important to remember not to spin the axe upon releasing it since it will cause an inconsistent spin and inaccurate throw. 5. 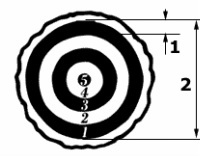 You can start practicing at 12 feet away from the target, the average distance for beginners. You can gradually adjust your distance until you're able to hit your target. *Remember to keep people away from the axe thrower, or at least 8 feet from either side of the target destination.